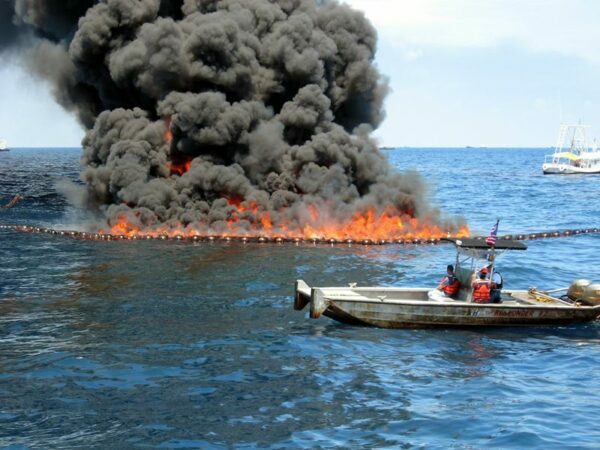 Pyroboom - SOS Safety International Inc.
A solid flotation barrier PyroBoom® has been demonstrated to maintain its effectiveness and structural continuity even after exposure to a 2400 of fire for up to 24 hours. Operationally, PyroBoom® exhibits the toughness and durability that are the trademarks of its siblings, GlobeBoom® and Oilfence™. 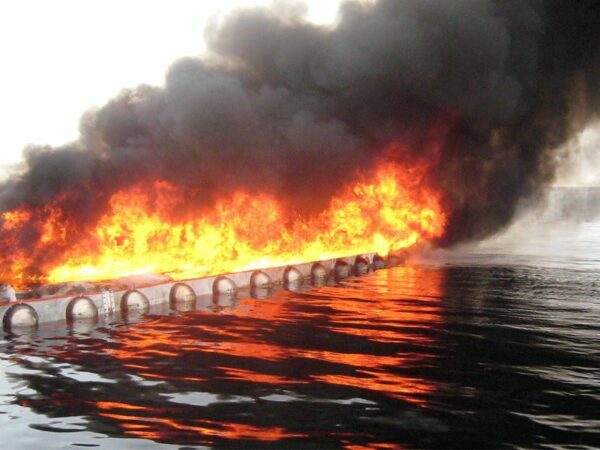 In-situ burning of oil spills is becoming recognized as an effective and efficient solution to removal of spilled oil. PyroBoom® is a unique barrier utilizing a blend of refractory fabrics and metals to achieve a continuous burning capability of over 24 hours in a boom with conventionally geometry and sea keeping characteristics. 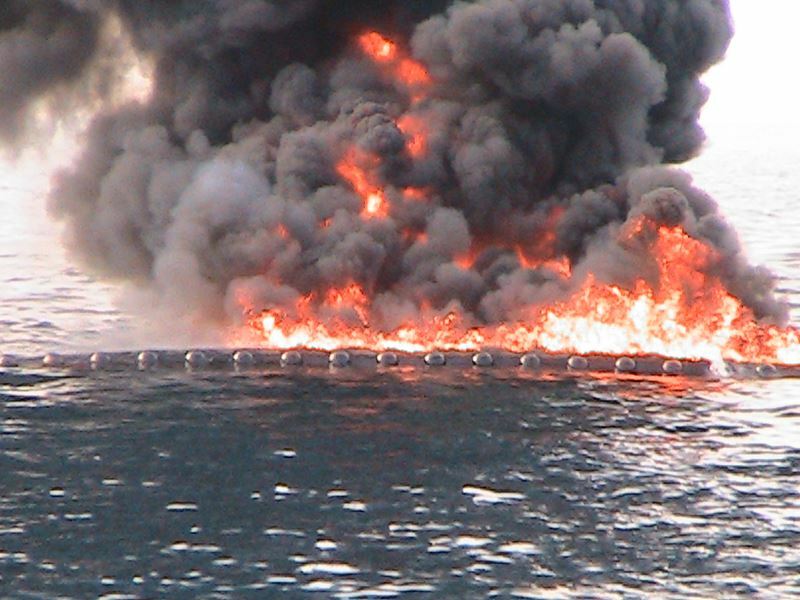 We have been developing PyroBoom® since 1983 to meet the strenuous and unique operating regime of in-situ burning of petroleum spills. 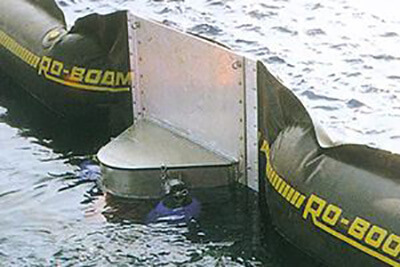 Easy Maintenance and Repair PyroBoom® is a solid flotation barrier that combines a unique wire reinforced refractory fabric for the above surface barrier with conventional GlobeBoom® fabric for the skirt. 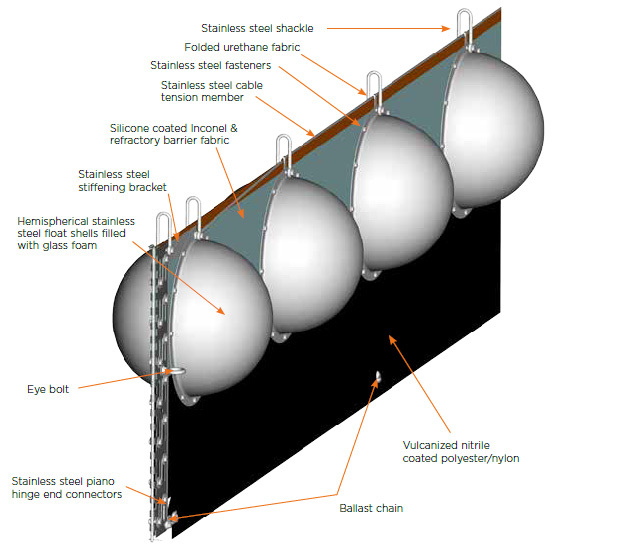 The glass foam filled, steel hemispheres are mechanically attached to the barrier. 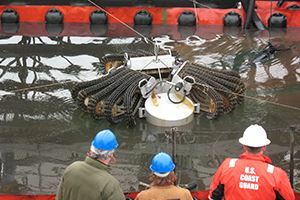 The modular construction allows for easy salvage, maintenance and repair in the field. Fabric Fireproof section consists of silicone coated, high temperature metallic (Inconel®) wires interwoven with similar wires and refractory materials (Fiberfrax®). For strength and flexibility below the water line, our proven PVC coated Polyester “ED” fabric is used. 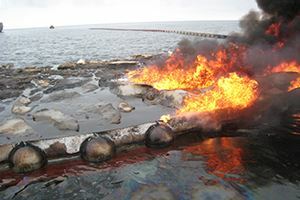 Developed specifically for In-situ burning of oil, PyroBoom® is the only product that meets all the responder’s needs from the Arctic to the tropics. In numerous burn tests, including those conducted in accordance with ASTM F 2152, PyroBoom® has repeatedly demonstrated its effectiveness, survivability and ease of use. 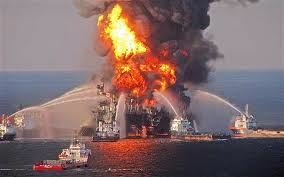 Other fire booms, including those using active water-cooled fabric blankets, are subject to burnthrough and catastrophic failure, especially if any component in the complex water cooling system fails. 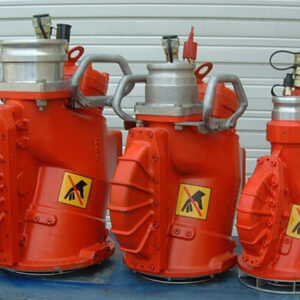 In addition, these designs are complicated to use, requiring extensive training and practice. They become water-logged; the resulting dramatic weight gain makes subsequent retrieval difficult, and drying, storage and maintenance virtually impossible in field conditions. In contrast, the advantages of the PyroBoom® design and construction have been proven repeatedly over 25 years of development, testing and real-world use. Our proprietary Inconel/Fiberfrax® refractory fabric with silicone coating has been proven in repeated burn tests at temperatures up to 1315°C/2400°F with no catastrophic failures.